Last weekend I was a part of the Philly Game Jam, hosted by Too Many Games and IGDA Philly. My team, Quadratron, made a video game, Mother(ship) in under 48. I was hoping to do a whole bunch of posts over the weekend, but maybe it’s for the best I didn’t. I have a high tolerence for caffeine, but my brain was still pretty well toasted. So what’s a game jam? 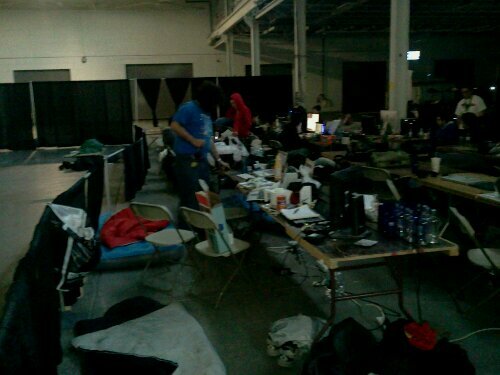 Basically it’s a contest, groups of people come to make games competitively within a short period of time. Generally your enemy is not the other teams, but the time limit and the stress of making a game. Granted, none of the games coming out of the jam are AAA quality, but most of the games have I’ve seen come out have quite a bit of polish. But that polish doesn’t come cheap. Taking up to 8 hours a day, sleep is usually the first sacrifice for the sake of making the game, in it’s place : energy drinks. As a 2-jam veteran I can tell you completely eliminating sleep isn’t going to help, but you only need about 6 hours sleep for the whole weekend. 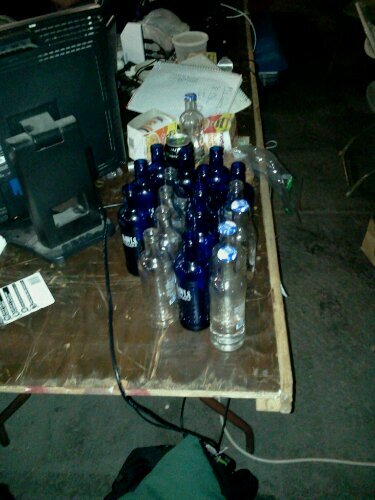 Many times we manage to get sponsorship from companies like Bawls, so I’ve grown fairly accustomed to the drink. When working straight through the night the trick is to drink lot’s of energy drinks, start early, because once you feel tired it’s too late. be possible, but 48 hours without food is not. 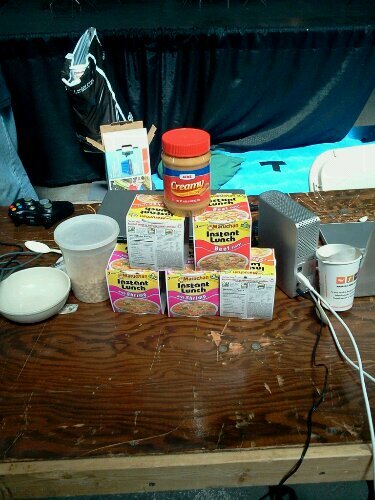 A few portable food sources such as bananas and ramen cups helped keep us on our feet. In addition to that we tried to get real food whenever we could. The end of the second night we ran out to Genardi’s where I got a roast beef sandwich (apparently I got the last half of the last roll somehow…) and soup. Day 3 after everything was said and done I had myself a cheese steak from Lee’s Hoagie’s. I apparently made quite an impression on my teammate when I made myself a breakfast of cheerios with Bawls instead of milk, but it did the job, and it tasted pretty good too. In the end, what matters is that we made a game in less than 48 hours! The theme was “mother” since it was Mother’s Day weekend, and after playing around with some ideas we came up with the idea of a Mothership. 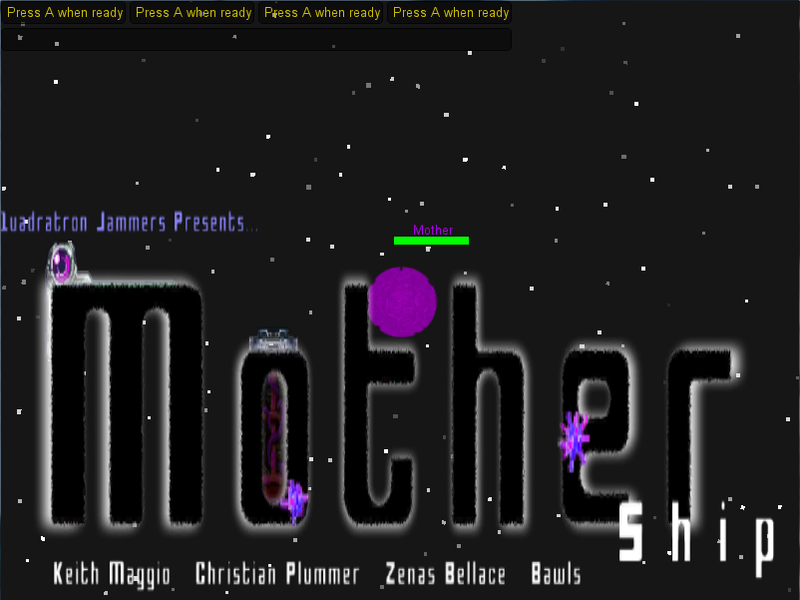 Hence the name of our game, Mother(ship). This mother ship is really mothery and clingy, and you have to protect her from aliens. We knew coming in we wanted a semi-casual, 4-player game with co-op, we even brought xbox controllers to plug in. Since Zenas had already started some work on a twin stick shooter (very basics) we decided to stick with that form of basic gameplay. Our artist bailed on us so we went for a simplistic old-school graphics approach which also let us get away with really cheap audio. Check out the game here http://bit.ly/iPiXGA. If you have a non-xbox 360 controller use the input tab on the configuration screen. Previous Previous post: Too Many Games! Next Next post: Summer-ho! Yaarr!